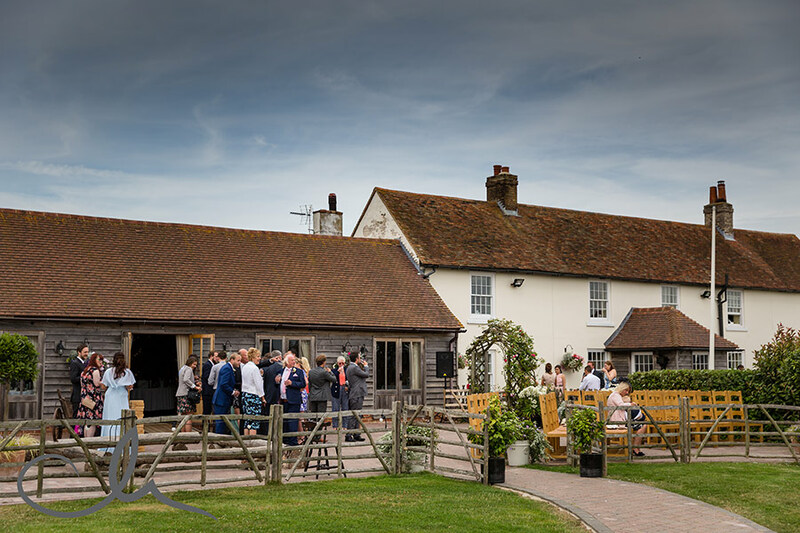 The Ferry House Inn is one of those wedding venues that quite simply take your breath away. The 16th Century Kentish country pub is located on the far reaches of the Swale Estuary, surrounded by farmland and water. It has a unique, ethereal atmosphere; a place where sea meets land and the overarching skies dominate the landscape. As a wedding photographer, I couldn’t ask for more. It was the ideal venue for Tanya and Chris’s intimate wedding ceremony, which was held in the gazebo, with its sweeping views of the estuary. The slight sea breeze was perfect for creating gentle movement in the photographs – ruffling Tanya’s hair and sweeping the soft net skirt of her dress out behind her. Tanya’s Wtoo Marine in Ivory over Rosegold A-line gown featured a bodice of ivory sculpted Venice lace motifs, with a row of pearl buttons at the back, and a rose gold satin skirt wrapped by an overlay of netting. The detailing of the bodice was equisite. Tanya’s face is wonderfully expressive and both she and Chris were very relaxed in front of the camera, which helped me to create some lovely intimate shots of the couple – clearly totally in love! The quality of light at this venue was fantastic, and one of my favourite images was taken just as the sun sent shafts of light through the greenery, illuminating Tanya and Chris in a golden haze. I found another location where wind was playing through some long grasses, providing the perfect soft focus backdrop to a charming posed image of the bride and groom. Helpfully, an old traditional Thames barge was anchored in the estuary, giving wonderful atmosphere to some of the shots. The reception was held in the gorgeous rustic timbered barn. Inside, hops had been draped along the sides and tiny twinkling lights spiralled around the wooden pillars. The beautifully crafted table decorations, featuring white birdcages and little wooden hearts complemented the location perfectly. I love the speeches, as it often gives me a chance to capture some wonderful informal images of the bridal party and guests. At Tanya and Chris’s wedding, the best man’s speech was truly hilarious and had everybody in stitches. A stunning sunset gave us a final opportunity to make the most of this amazing venue.